Welcome in the first proper post (only five months since I have launched the blog :P No, seriously, I am going to write more often, promise). If you know my Facebook page, you probably have realized so far that I love experiments with natural dyeing. My usual material for dyeing experiments is wool (from practical and historical reasons). But today's post is about linen. If you are Early Medieval, Viking or Saxon reenactor, or you are interested in the history of textiles, you probably already know, that the linen was not the popular fiber to dye. This is due to several reasons: it does not accept colour very well (opposite to protein fibers, e.g. wool) and it is not very colourfast after dyeing. Also, with big probability linen was used mostly for undergarment which means it was washed quite often - and traditional way of washing are quite harsh: lye, and a lot of beating and scrubbing - which would lead to further destruction of colour. That does not mean that linen was not dyed at all. 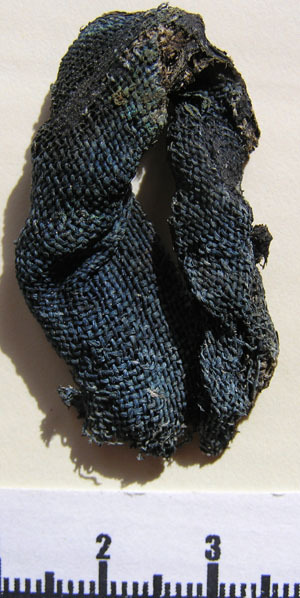 There are some findings of linen garments with traces of indigotin - in Early Medieval Europe it means that the used dyestuff was woad (e.g. Pskov dress - more info under this link), on the photo you can see fragment of it (probably a loop) with preserved traces of dyestuff (after the page: livinghistory.cz). Well, for me all these sources were good enough reason to try dye on linen myself :) I have already tried woad on linen, so this time I decided to play with madder. My first trials - linen mordanted only with alum - resulted in pale pink colour, as you can see in the photos (it is this the palest sample, in the colour of cooked ham :P). I was not very impressed, so started to do proper searching and, in the book 'Colourful Past' I have found recipe from Haarlem Manuscript, written 17th century Haarlem, advising to mordant linen with bran, cream of tartar and alum (you can see it on the one of photos). However not medieval, it contained ingredients available in Medieval as well, so decided to try it. Also, during my research, I have found an article about dyeing cellulose fibers, which recommended to mordant them in tannins first, then use alum: link. I have found authors' results quite impressive and decided to give it a go as well. The results you have on photos. This darkest sample is from double mordanting - it is nice shade of pink (something between raspberry pink and brick orange). The Haarlem Manuscript one is slightly paler and pinker in shadow (the third one comes from my previous experiment with alum mordanting). Both are pink though :) Considering that from kermes you can also have pink, maybe Early Medieval was actually 50 Shades of Pink (at least in the subject of linen ;)? I like my results but comparing to wool they are relatively pale. The question is, what would be the opinion of people living 1000 years ago? And if not, how to improve the result? There still one thing which I would like to do. I have used natural grey linen. So next time I want to bleach linen on natural way - with a lot of wood ash lye, water and sun. And then dye it. I hope for nice results!